We are sitting in D&M’s Bakery Cafe in Angaston, having a slow and relaxing lunch. Our day began with a drive from our motel into the heart of Nuriootpa to find a cafe for breakfast. We passed one open one before reaching the far end of the town and turning around at the shopping mall there, where nothing was open yet. We headed back to the only open place we’d seen, a place called Linke’s Bakery and Tearooms. This turned out to have a large area of cafe seating and a hot breakfast menu, so we sat at a table by a window looking out on the street. M. got the muesli with yoghurt, while I decided to start my Snot Block & Roll reviews first thing in the morning by trying a sausage roll and a vanilla slice. Several people came and went ordering coffees as we ate, and a few people came in for breakfast as well. After eating, we went back to the motel to pack the car and check out. Then we drove towards Angaston for the Barossa Valley Farmer’s Market, which operates every Saturday morning. This was evidently very popular, as the street was lined with parked cars for about 100 metres back from the entrance to the site. We managed to get a spot right near the driveway and walked in, where there was a bustling car park full of cars. The market was mostly inside a huge tin shed, called the Vintner’s Shed, with some stalls of fresh vegetables and fruits spilling outside. Inside the shed were four aisles of market stalls, selling everything from fresh carrots to jams, sauces, condiments, as well as bakery goods, meats, fish, honey, cakes, nuts, and so on. There was one large stall selling hot food including egg and bacon rolls, strawberry pancakes, and a few other things. Saskia Beer had a stall there and she was there cooking various stuff wi her mother Maggie helping briefly. We managed to get a photo of M. and Maggie together in one discreet shot before Maggie left and we didn’t see her again. 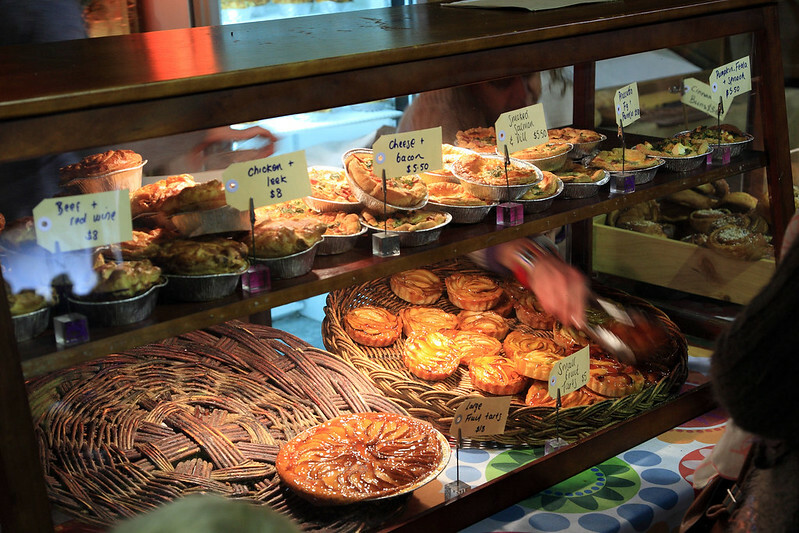 Pies, tarts, cakes. 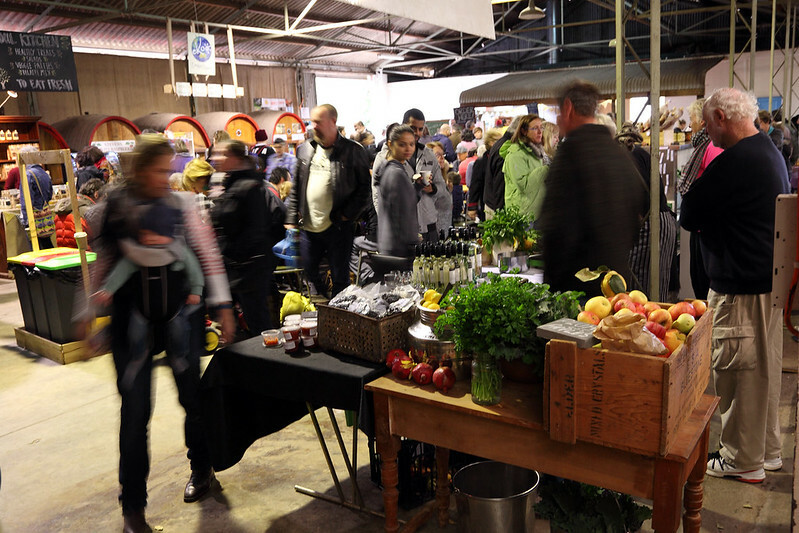 Barossa Valley Farmer’s Market. We walked around the market, sampling lots of things. One place had infused honeys, including one with star anise, which was so brilliant I bought a jar. M. bought a cardamom roll from a baker, who explained that their sweet rolls were all traditionally Swedish. She also got an orange “power ball” with nuts and seeds and dates and stuff in it. Outside we bought a bag of four different apples from a guy who was selling them, to give us something to much in the car on the drive to Clare this afternoon. From the farmer’s market, we went towards Angaston, thinking there would be another different market at the Town Hall there today, but we realised that all the signs advertising it said 10 May, which is tomorrow, so we had to change our plans. We looked in the tourist book for something else to do for a while, and found the Woodcarver’s Haven, a short drive out of Angaston. We drove out there through bright morning sunshine, passing through some picturesque country scenery with fields dotted with huge old gum trees. Landscape near Woodcarver’s Haven. 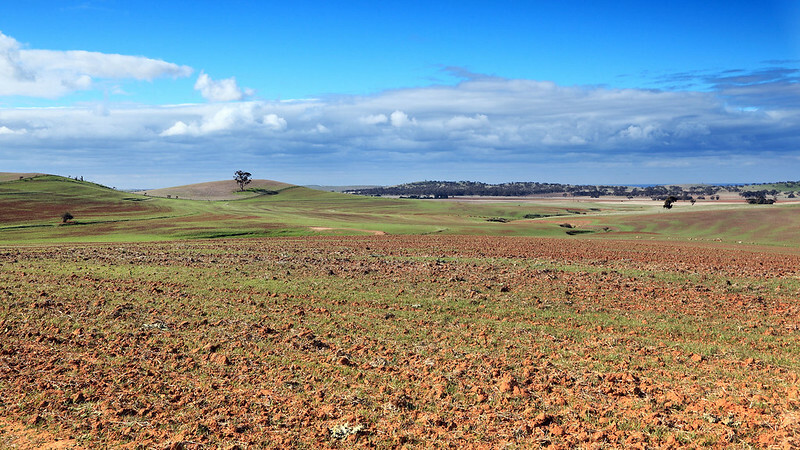 Barossa Valley. The Woodcarver’s Haven turned out to be a farm owned by one guy who did woodworking in a shed near his house. As we drove in, a large golden retriever with a pink plastic fetch stick in its mouth raced out to greet our car, and kept trying to stand in front of it whenever we drove forwards. Eventually we turned into the visitor parking area, which the dog deigned to allow us to do. Perhaps it had been trained to direct traffic there rather than into the private parts of the property. The man’s work shed held some magnificent carved wooden rocking horses, and very little else. There was a bit of unfinished furniture, one turned pepper mill, and a few turned honey drippers, and that was about it. Rocking horses were obviously this guy’s specialty, as there were five completed ones and several partly finished scattered around. After looking at the deserted place for a few minutes, the owner arrived and chatted with us for a bit. We’d expected more bowls and tableware and stuff like that, so there wasn’t much for us to do but say thanks and leave. 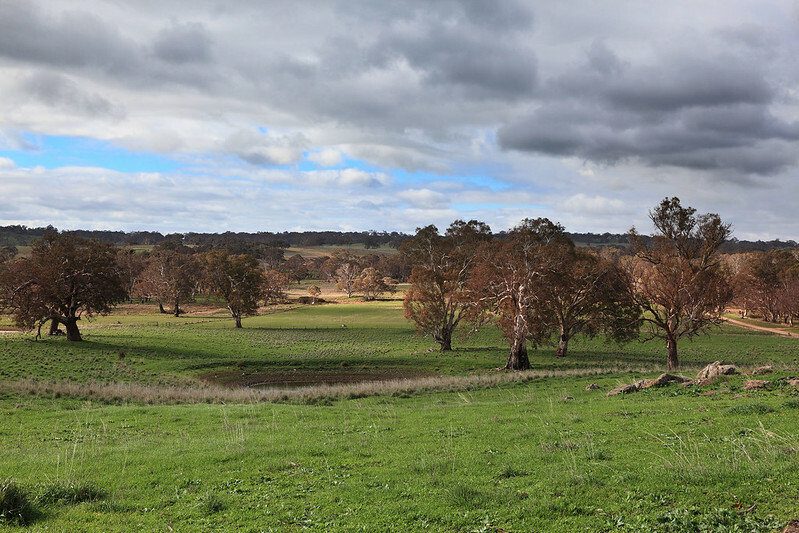 On the way back to Angaston we stopped the car a few times by the side of the road to take photos of the countryside scenery. The light was beautiful, with bright sunshine peeking through heavy cloud. It seems to be a much better day than the last two, with no rain yet. Back in Angaston we stopped in at D&M’s Bakery Cafe for a rest break which has turned into a casual lunch. I had to try the sausage roll and vanilla slice here, and the place advertises itself as having the “best vanilla slice in the Barossa Valley”. M. has had a cheese and feta roll, and I will try a lamb and rosemary pie before we leave for the afternoon drive over to Clare. We are sitting in a wine bar and restaurant called Seed Winehouse, in the town of Clare. We wanted to come here for dinner, but being a Saturday they are booked out, so we will head somewhere else once we have finished our glasses of Clare Valley Riesling. My lambs and rosemary pie for lunch was excellent. After finishing that, we began our drive from the Barossa to the Clare Valley, heading north through the town of Truro to Eudunda, where we stopped to stretch our legs and have a look at the commemorative statue of Colin Thiele, the famous author who was born in Eudunda. 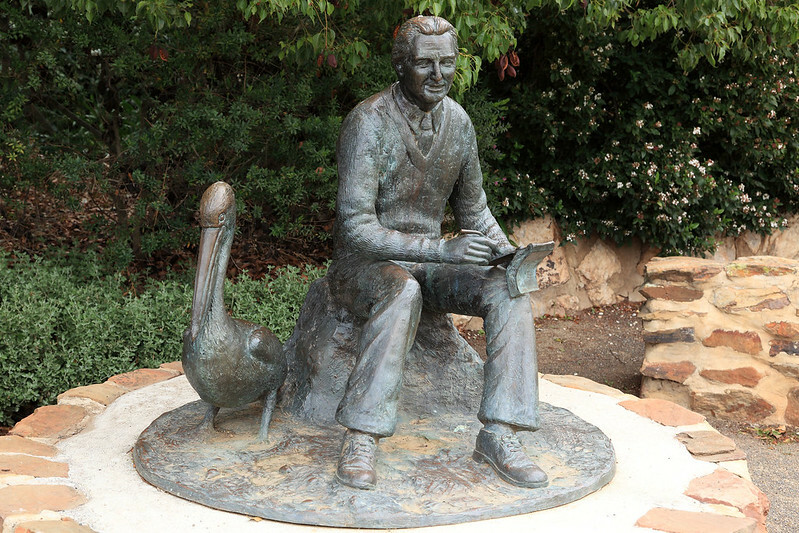 His statue had a pelican sitting next to him, alluding to his novel Storm Boy. We walked down the tiny main street and found the Eudunda Family Heritage Gallery museum, which we entered. It was staffed by an old lady and an old man, who looked delighted to see any visitors at all. The lady gave us multiple brochures and chatted excitedly about the historical displays, not wanting to leave us along. The displays were of the time-worn historical household items that you tend to get in small country town historical museums, but they were obviously arranged with loving care and carefully labelled with hand written pieces of card. The museum was much larger than we expected, extending to an adjacent shopfront, then out the back to a large storage shed which held old farm equipment and a vintage petrol powered go-kart among other things, and then further still out to an old cottage out the back, which was furnished with antiques and held displays of home life in times gone by. One room contained a collection of vintage wedding dresses, donated by various families. The collection was actually quite astounding, including so much stuff that it would have put many other country town historical museums to shame. The lady wandered around, helpfully opening up the back shed and the cottage for us, and narrating about various bits and pieces as we walked past to look at them. Once done there, we drove on to the town of Burra, making a short detour to see if the Burra Gorge was worth looking at. The road to the gorge ended at a campground and a walking track snaked off into the hills, with no indication of how long the walk was, so we gave it a miss as we didn’t have a lot of time to spare. 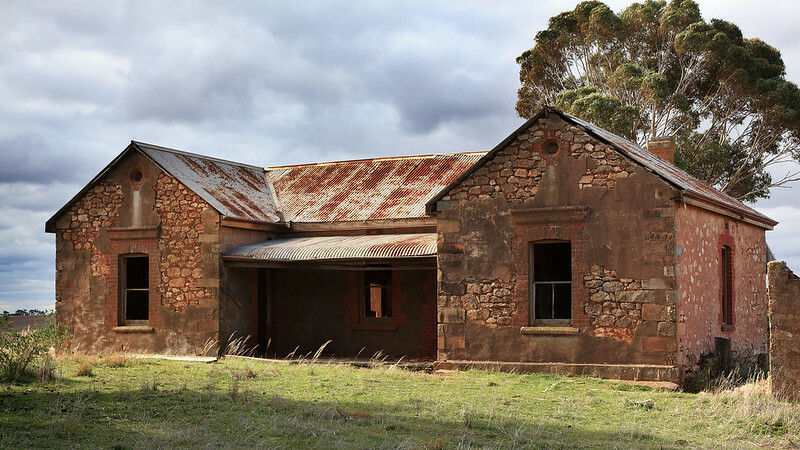 In Burra we stopped to find a ceramic workshop listed in our tourist guide, but couldn’t find it. I asked in a craft shop and the man there said the ceramics lady had owned the very shop we were in, but had packed up and left before Christmas! So we left Burra and drove the rest of the way to Clare, arriving about 16:30 and going to the Clare Valley Motel to see if they had a room. It seems we were in luck, as the man at reception said they had one room left. We took it for two nights, as we intend to spend all day tomorrow in the area. 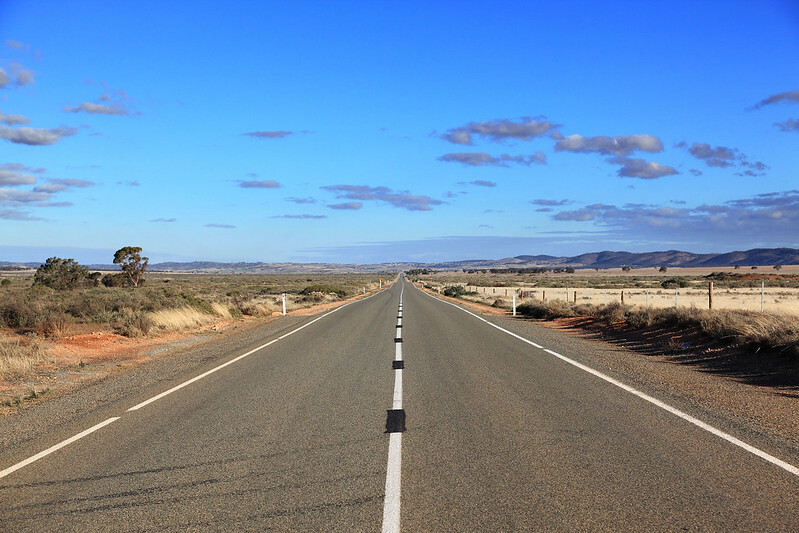 World’s End Highway, from Eudunda to Clare. After dropping our bags in the room we headed back into town to check out Seed Winehouse and see if we could get a table for dinner. When they told us they were booked out weeks ago, we settled for having a glass of wine at a table near the bar before heading elsewhere for dinner. I had a sweetish local Riesling while M. went for a drier one. We are in the Clare Asian Cuisine restaurant, next door to Seed. It seems to be basically a Thai place, but it has some Cantonese and Szechuan staples on the menu as well. I presume the Thai owners have incorporated these into their repertoire because the town has no Chinese restaurant. M. ordered a vegetable pad Thai, while I have ordered the green chicken curry with some rice. I suspect the food may be some time coming, as the kitchen seems a bit slow, and some other people on other tables are looking around hungrily. Well, when our food arrived, finally, after 55 minutes, the vegetarian pad Thai we’d ordered had prawns in it, so we just got up and left. We were very hungry by this point and walked up the cold street to find somewhere else to eat. We passed a Subway sandwich place, and a pizza and pasta bar, but M. spotted an Indian restaurant near the far end of town: Indii of Clare. 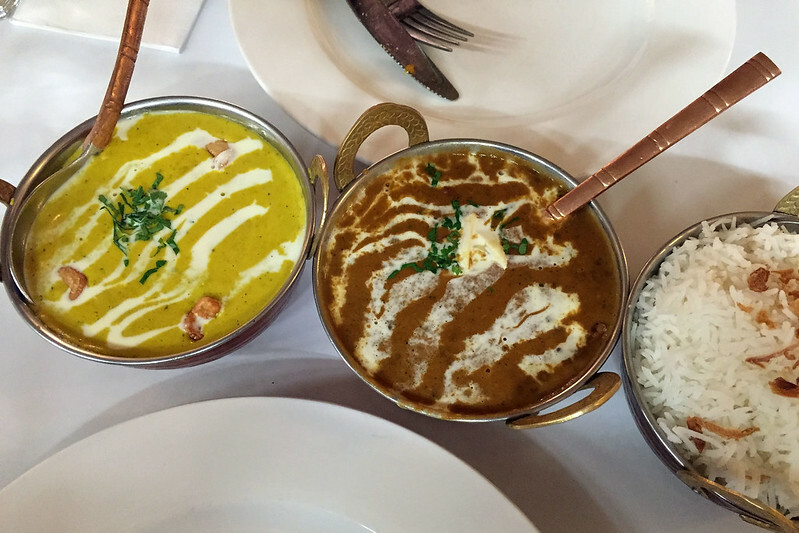 We entered to find plenty of tables available and quick service with poppadoms on our table almost as we sat down, and an entree of samosas arriving just a couple of minutes later after we ordered them, plus some dhal makhni and malai kofta for mains. These were reasonably good, both coming in very creamy sauces. The dhal was a dark brown version rich with beans, while the malai kofta were in a rich and thick ground cashew sauce, yellow with spices but no tomato as we usually see at home. After eating our fill we returned to our motel to plan tomorrow’s adventures and read a bit before getting some sleep. This entry was posted on Sunday, 23 August, 2015 at 19:14	and is filed under Diary. You can follow any responses to this entry through the RSS 2.0 feed. You can skip to the end and leave a response. Pinging is currently not allowed.